MacOSFullScreen is a native extension to allow applications to use native full screen move in Mac OS (Lion or higher). It allows the application to have its own space created, so user can interact with it the way they already do with other applications in the system, using Mission Control, for instance. The extension is based on a single method call. After invoking the method, the application becomes full screen. 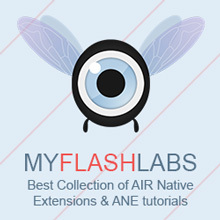 Air Native Extension, Mac. URL.